Posted by Ada Wang on 11/24/2018 11:59:45 AM. Everyone may have this demand for converting epub to pdf, if he gathered lots of eBook files, but the reading device doesn't support ePub format but only PDF. So converting epub to pdf now attracts more and more attention. And there are several solutions, such as convert ePub to PDF with Calibre, or ePub to PDF converter freeware, and so on. To know more please click how to convert more than 100mb ePub to pdf. This article aims to guide you convert epub to pdf online. There are so many epub to pdf online converter sites that you may feel confused and hesitate which one to use when you searching the Internet to find an answer. So here I specially prepared some good sites, and describe their respective features, pros and cons. A very convenient online eBook Converter, no need to sign up, download the converted PDF directly. 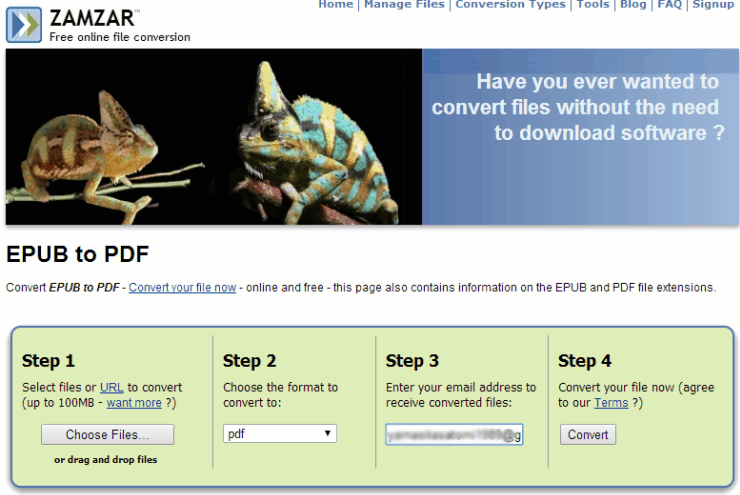 Only take 3 steps to convert your files to pdf. Support many formats. Features: Supports many formats and works pretty well in converting PDF; provider also helps convert ebooks with software, unlike online site, before ebook converting drm removing job will be done perfectly. Supported input: EPUB, PDF, Mobi, unprotected AZW/AZW3/AZW4, unprotected TOPAZ, unprotected PRC, unprotected TPZ, HTML, TXT, LIT, LRF, FB2, PDB, etc. Supported output: PDF, Mobi, ePub. File access: Email & Direct Download. Unlike many other online converters, here with this tool you don't have to sign up, input your own personal information. After conversion completed you can view your files from browser, or you can also input your email address to receive your converted pdf books. Then read them on computer, and even transfer them to iPad, Kobo, etc. Update: to provide better service, epubor has updated this online site, and now you can directly download the converted files, no need to input the email any more. Another reason I recommend you this site is the DRM checking. In fact nearly all the free online converters don't support converting files with DRM. But most of our purchased books from store are with drm, and we even don't know which book has this limitation, so after we selected one book with drm, most online would just tell us "failure". But Epubor online converter site will give you a warm tip, not saying like "our support center will resolve the problem". He will tell you the specific reason, and even teach you how to resolve. 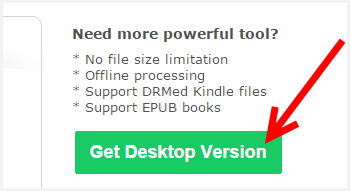 Update: Since epubor has updated this online eBook converter site, now when you adding drm protected eBooks to convert, the tip you receive is no longer the same as what I shown above, but below. To save your time and reduce your worries, it just tells some words like "Kindle DRM", "Adept DRM", "Nook DRM", etc. Update: What's more, it also provides you a desktop version which will help you resolve the problem when you can't convert DRMed eBooks. In other words, the desktop version helps you not only convert eBooks but also remove drm. Note:If you want to convert DRM-Protected ePub, or wanted to batch convert your books, you can download this Desktop Version. Update: If you want to convert Kindle eBooks from your e-ink devices, I think you may need the free online Kindle drm removal first. Only after you get the files free from the drm prison, you can convert them to ePub or PDF formats, right? Zamzar is famous for its online conversion service. It's free, and very easy to use. It places all steps at the same page, you just need to follow these steps one by one, then you will get your converted files soon. Features: Detailed explanation for each format extension. For example, which system this file is developed by, what the development history is, what the technical details are, which app to open this output format, and even more. Supported input: EPUB, CBZ, CBR, CBC, CHM, FB2, LIT, LRF, MOBI, PRC, PDB, PML, RB, TCR. Supported output: PDF, EPUB, MOBI, FB2, LIT, LRF, OEB, PDB, PML, RB, TXT, TCR. Batch conversion: Yes, but up to 100MB. Larger size needs to pay money. I recommend this site because it helps us convert files to pdf optimized for ebook reader. Features: Selecting epub files from Dropbox is possible; optional settings are supported, such as target ebook reader, change book metadata ( ebook title, ebook author). Supported input: EPUB, Mobi, HTML, RTF, TXT, OEB. Supported output: PDF, ePub, AZW, FB2, LRF, MOBI, PDB, TCR, LIT. OK this article has come to the end. But perhaps you also concern other ways of converting epub to pdf. About this topic I have written in-depth guides for you, and collected them together.